Earlier this month, Microsoft gave its SkyDrive cloud storage service a complete design overhaul that brought it in line with the look and feel of Microsoft’s Windows 8 Metro UI. At that time, Microsoft also promised to release its first official SkyDrive for Android app soon and the app has now appeared in the Google Play store. The Android app joins Microsoft’s Windows Phone and iOS apps for SkyDrive and offers virtually the same features. To use the app, Android users need to run Android 2.3 and above, though Microsoft notes that it works best with Android 4.0. Just like the apps for Windows Phone and iOS, the Android app gives you easy access to all of the documents you’ve stored on the service. You can also see a list of recently opened documents, as well as documents that others have shared with you. 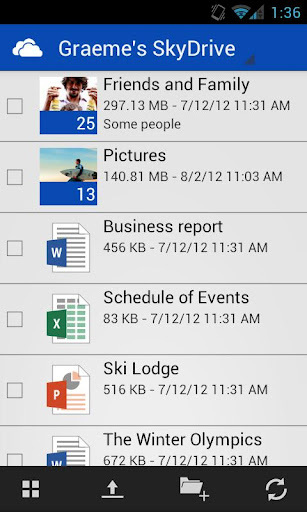 You can also open your files with other Android apps and upload files from your Android device to SkyDrive. As far as we can see, the app does not cache local copies of your files for offline usage, however. While it still feels somewhat odd for Microsoft to launch apps for competing platforms like iOS, Android and OS X, the company has recently made a number of efforts to expand the reach of services like SkyDrive or OneNote. Given that SkyDrive is also somewhat of a hub for many of Microsoft’s web-based initiatives, including its Office web apps, and a cornerstone of its online initiatives, it only makes sense for the company to get as many users as possible to try the service. With SkyDrive, Microsoft is directly competing with services like SugarSync, Dropbox, Google Drive and Apple’s iCloud. SkyDrive, however, offers new users more free storage (up to 7GB) and additional storage is generally cheaper than on competing platforms.